The Kali Star Quilt can be made soft and subtle or dramatic and striking depending on the fabric choice and the strip sets. 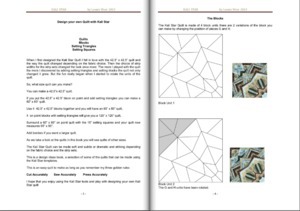 This is a design ideas book, a selection of some of the quilts that can be made using the Kali Star templates. 70 pages of ideas written to supplement the Kali Star Template set.